Memory lapses are common as you age, but there are ways to help your brain store new information and recall it later. Does this sound familiar? You go into the kitchen, but can't remember why. Or you can't recall a name you just heard during a conversation, or miss a routine appointment because it slipped your mind. "Everyday memory lapses like this can be upsetting, but they are more common than we often assume," says Dr. Joel Salinas, a neurologist specializing in behavioral neurology and neuropsychiatry at Harvard-affiliated Massachusetts General Hospital. "As you physically age, so does your brain, and as the structure of the brain ages, so does its ability to think and process. Almost all of your brain's abilities slowly decline after young adulthood with a few exceptions, such as vocabulary. These changes can make it slightly more difficult at times to learn and recall new and existing information." However, the good news is that many of these types of memory lapses are not necessarily signs of dementia due to brain diseases like Alzheimer's. 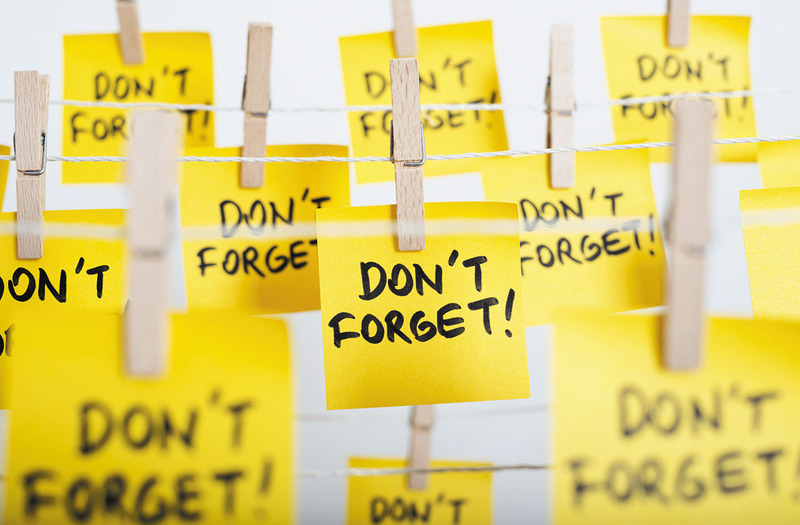 Even better news: there may be ways to help sharpen your everyday memory. Many people notice these types of memory lapses beginning in their 50s. This is when age-related chemical and structural changes can begin in brain regions involved with memory processing, such as the hippocampus or the frontal lobes, says Dr. Salinas. "As brain cells have a harder time functioning, the networks they're a part of also have a harder time if there aren't other cells ready to serve as spares," he says. "Imagine a large choir, for example. If one tenor loses his voice, the audience might not be able to tell the difference. But you'll be in trouble if many tenors lose their voices and there are no understudies to take their place." These brain changes at the level of cells and cell networks may slow processing speed, occasionally making it hard to recall familiar names, words, or new information. However, age is not always the only culprit. Memory is susceptible to depression, anxiety, stress, medication side effects, and lack of sleep, so it's important to speak with your doctor to determine if any of these may be related to your lapses. While you cannot reverse the effects of aging, there are ways to sharpen your everyday memory and help your brain obtain and retain information. Here are a few strategies that may help. Get organized. If you routinely misplace items, keep them in a designated space. For example, put all your everyday belongings, like glasses, keys, and wallet, in one container and place it in a spot with regular foot traffic. "The repetition of finding these items in the same place makes it easier for your brain to learn the pattern and create a habit that becomes second nature," says Dr. Salinas. Set reminders. Write notes and leave them where you'll see them. For example, post a sticky note on your bathroom mirror to remind you to go to your afternoon appointment or to take your medicine. You can also use the alarm on your cellphone, or have a friend call you. Another option is to email yourself reminders. Break down tasks. If you have trouble remembering an entire sequence of steps needed to complete a task, break it down into smaller parts and address them one at a time. For example, memorize the first three numbers of a phone number, then the next three, then the last four. "The brain has an easier time paying attention to quick, small chunks of information than long unwieldy strings of information, especially if that information has no logical sequence," says Dr. Salinas. Repeat, repeat, repeat. Repetition increases the likelihood you'll record the information and can retrieve it later. Repeat out loud what you heard, read, or thought. When you meet someone for the first time, repeat their name twice. For instance, say "Mark .... It's great to meet you, Mark!" When someone gives you directions, repeat them back, step by step. After you have an important conversation, for example with your doctor, on the ride home recite out loud over and over what was said during the appointment. Create an association. Make mental snapshots of what you want to remember, and combine, exaggerate, or distort them so they stand out. For instance, if you parked your car in space 3B, picture three enormous bees hovering over your car. If it is an odd or emotion-inducing image, you are more likely to remember it. Keep learning. Place yourself in situations where you have to consistently learn and recall new information. Get a part-time job or volunteer. Take a class at the local college, learn an instrument, take an art class, play chess or bridge, or join a book club. Challenging yourself is the key. Picture this. Playing out an action in your mind may help you remember to do it. For example, when you need to pick up milk on your way home, recreate the activity in your mind in vivid detail. Imagine yourself walking into the store, going to the dairy section, choosing a specific brand, and then paying for it, and mentally repeat the sequence over and over. It might feel awkward at first, but the technique has been shown to help enhance prospective memory — the ability to remember to perform a planned action — even among people who suffer from mild cognitive impairment, according to a study in the July 2018 Neuropsychology. Stay connected. Research has found that regular social interaction provides mental stimulation. Conversing, listening, and recalling information all can help improve your memory. Some studies have suggested that just 10 minutes of conversation can be effective. "Overall, people who are more socially integrated also are more likely to have healthier functioning brains and a lower risks for age-related brain diseases, like stroke or dementia," says Dr. Salinas.